Extend a 4Kx2K HDMI display up to 300 feet away from the source. Transmits HDMI signal over one CAT5e/6/6a/7 solid cable. Extend up to 150 feet with solid unshielded CAT5e/6 cable. Extend up to 250 feet with solid shielded CAT5e/6 cable. Extend up to 300 feet with solid CAT6a/7 cable (23 AWG). 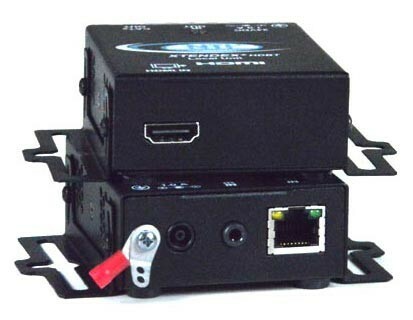 Compatible with a computer or Ultra-HD video source with HDMI output. One female 3.5mm port for IR emitter. IR frequency range: 33 to 40 kHz. Center Carrier Frequency: 36 kHz. 150 feet (46 meters) over CAT5e/6 solid unshielded shielded cable. 250 feet (76 meters) over CAT5e/6 solid shielded cable. 300 feet (91 meters) over CAT6a/7 solid cable (23 AWG). CAT5e/6 solid unshielded: up to 150 feet. CAT5e/6 solid shielded: up to 250 feet. CAT6a/7 solid (23 AWG): up to 300 feet.